Do you know who the disciples were? Can you name their names? They followed Jesus everywhere and learned how to love like Him. Open up and find out what else they did! 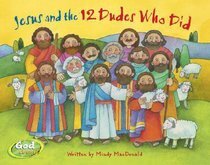 About "Jesus and the 12 Dudes Who Did (Godcounts Series)"
Young ones learn what it means to be a disciple today, and how to live for Jesus in the same way as the 12 Dudes Who Did. Mindy MacDonald graduated from the University of Oregon with a degree in Kinesiology. But it was not until she took a job at a local Christian bookstore where she discovered her passion for books. Mindy's gift in storytelling was further cultivated as an elementary school education assistant and has since taken classes in writing children's literature. Mindy and her husband are motivated by bringing God glory through their writing and musical talents. They make their home in central Oregon with their two cats, Jack and Charlie. Mindy MacDonald graduated from the University of Oregon with a degree in kinesiology. But it wasn't until she took a job at a local Christian bookstore that she discovered her passion for books. Mindy's gift for storytelling was further cultivated when she worked as an elementary school education assistant, and she has since taken classes in writing children's literature. Mindy and her husband are motivated by bringing God glory through their writing and musical talents. They make their home in New Jersey with their two cats, Jack and Charlie. How many kinds of fruit can you think of? Where does it come from and how does it grow? Nine Fruits Alive describes the fruit that comes from God's Spirit. Little ones will learn that just like water and sunlight help oranges grow on an orange tree, loving God and obeying His word will grow in us the fruit of God's Spirit, like joy, goodness, peace and more! God loves to see His fruit in all of us and this book will help young ones understand how it grows! GODCOUNTS: These innovative board books use bright and colourful illustrations, cut-out pages, tactile elements and fun rhymes to communicate favourite Bible stories to children! Kids will love reading along for themselves or sharing with a grownup. Ages 1-4. This innovative board book uses bright and colourful illustrations, cut-out pages, tactile elements, and fun rhymes to communicate a favourite Bible story to children! Kids will love reading along for themselves or sharing with a grownup. Ages 1-4. If you've ever wondered where everything came from - like the flowers outside, the birds in the sky, or the moon at night - 7 Days of Creation is the book to read! It explains to little ones what God did on each of the seven days and how things came to be along the way! It helps kids understand not only how great and powerful God is, but how creative He is too! He is the Master at arts and crafts, and He loves His creation more than anything.